Blog More on "Lip Balm"
Last year I wrote a post, “Drug Claims and Lip Balm” which discussed the use of the phrase “lip balm” as the identity of a product. 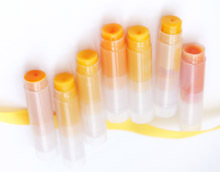 Unlike “lipstick” or “lip gloss,” the specific term “lip balm” is cited in the over-the-counter drug monograph for “skin protectants” as one of the approved ways to identify a skin protectant (which is a drug). I am seeking some clarification on the use of the term “lip balm” as used to identify a product. 21 CFR 347:50, Labeling of skin protectant drug products, specifies the use of the term “lip balm” as one way in which skin protectants used on lips may be identified. Within the handcrafted soap and cosmetic industry, the term “lip balm” has become a generic term used to identify lip products that are intended only to moisturize (and sometimes color) the lips. The ingredients in these products are generally a combination of food grade hard and soft oils, a wax (typically beeswax, but sometimes other food grade waxes), and optionally a flavor and/or color. Such manufacturers do not make claims that the product is a “skin protectant”, nor do they include sunscreen or other active ingredients. … Clarification from the FDA on whether the use of the term “lip balm” is allowed to identify lip products other than those that are claimed to be skin protectants would be of great assistance to the handcrafted cosmetic community. Is the use of the term “lip balm” RESTRICTED in use to only identify skin protectant products? In other words, does the use of the term “lip balm” cause the product to be considered skin protectant, even if no skin protectant claims are made and the product, by virtue of actual claims would otherwise be considered a cosmetic? These types of products would be considered cosmetics granted they were not making drug claims (as in claiming to diagnose or treat any type of disease). So, apparently it IS okay to use the term “lip balm” to describe a product, so long as there is no claim that it will diagnose or treat any type of disease. Keep in mind that “chapped lips” is a “disease” in the eyes of the FDA, so preventing or treating chapped lips would be a (drug) claim to diagnose, treat or prevent a disease, making the product an unapproved drug. On the flip side, a claim that your lip balm product “improves appearance” would be only a cosmetic claim, and keep it in the cosmetic product category. The information I’ve provided here is what I received from the FDA. It was not worded as an “official opinion” of the FDA, and I have no idea what side-check the data went through before being sent to me. I want to believe that all the information received in any form of communication from any FDA staff is always accurate, but my experience tells me that there have been times that FDA staff haven’t been totally correct. So take the information with a (small) grain of salt and be watchful in how you use the term “lip balm” to describe any lip product. Good Gracious! And thanks for the heads up and good work , always appreciated ! I just realized I have a question:) Can you still say balm at all, as in foot balm? or cuticle balm? I did some searching and couldn’t find anything within the regulations or on the FDA site that restricts the use of the term “balm” except for the places where it’s used as “lip balm”. I also checked the definition of “balm” at http://www.yourdictionary.com, http://www.definitions.com and King James Bible Dictionary. Among the various definitions are several that refer to “healing or soothing,” and some refer to “treatment”, but other definitions include “a pleasing aromatic fragrance,” “anything healing or soothing, esp. to the mind or temper,” and several other similar definitions. Based on the definitions for “balm,” it could be used to identify either a drug OR a cosmetic – so it comes back to the intended use of the product. If the intended use is to treat, cure, mitigate or prevent disease, or to alter the function or structure of the body, then it would be a drug. If it is applied to the human body to improve appearance or beautify then it’s a cosmetic. A “foot balm” that is intended to make the feet smoother, softer and more attractive (and maybe smell good) would be a cosmetic. A “foot balm” that is intended to prevent or cure cracked, dry feet or that is promoted as anti-fungal would be a drug. Wow, thank you so much for taking the time to get this valuable information from the FDA for us! Thank you for the info Marie!! Cocoa butter is cocoa butter. It’s a common ingredient in cosmetics. There IS a monograph for using cocoa butter at 50% – 100% as an active ingredient for a skin or lip protectant. Using it at that rate and claiming the product actually PROTECTS the skin or lips causes the product to be a drug. In order to be marketed as such it would need to follow the regulations for Skin Protectant Drug Products for Over-The-Counter Human Use, covered in 21 CFR 347, AND the manufacturer would need to be registered with the FDA as a drug manufacturer and follow all the required good manufacturing guidelines for drug manufacture (which are in regulation). Thank you for posting all of your wonderful research. It can be so confusing searching through the FDA’s website pages. I was wondering about lip balms that are designed to ease cold sores. What can I say on the label? Medicated? Sooth cold sores? Any suggestions would be greatly appreciated. I own you labeling book and am purchasing your GMP book now. Thanks! Cold sores are a “disease” and are caused by the “function and structure of the body”. Anything that claims to treat cold sores would be claiming to modify the function or structure of the body or to cure, mitigate, or prevent the disease of cold sores. Either way, those would be drug claims, and would very likely make the product a “new unapproved drug” in the eyes of the FDA. Remember, it has to do with the INTENT of the product. Any product with the INTENT to treat, cure mitigate or prevent disease is a drug (which, of course, requires FDA approval in most cases, as well as an approved drug manufacturing facility). Products with the intent to make a person more attractive or beautiful or to alter the APPEARANCE (not the function or structure) of the body is a cosmetic and doesn’t require FDA approval. Be very careful marketing or making claims for a product that is intended to treat cold sores. We were just discussing it over at soaping101 and wondering about it. There are a couple of places where the FDA uses “lip protectant” (including the term “lip balm”) as an example of a cosmetic that is also a drug. I contacted the FDA last year about that, and was told that the term “lip balm” may be used for cosmetics and it is NOT considered a drug just by the use of the name alone. I don’t think the updates to the FDA website changes that. Hi, so I’ve been reading some of the post here and was wondering would the word salve fall with the word balm? If I call my product a salve, would it be considered a drug or cosmetic? Thanks so much for all your help! So, “lip butter is fine”. Is “body butter” also fine? What if it has Shea butter in it? Does that run into the “can’t have an ingredient in the name” rule? In order to use the USDA Certified seal or to claim the product meets Organic standards, it you and the product must be registered with the USDA through the National Organic Program. That said, the current law apparently does not prohibit cosmetic products from implying organic status. It is the subject of several lawsuits. See my blog post What about “Organic” Cosmetics? for a more in-depth look. The FDA doesn’t approve any cosmetic products – organic or otherwise. In fact, it is considered misbranding to state that your cosmetic product has “FDA approval”. Drugs, of course, do need FDA approval or – in the case of over-the-counter drugs – they must meet pre-approved FDA standards. Maria a new rumor is circulating around saying in March of this year the FDA ruled that you couldn’t use the term Lip Balm any more. Is there any truth in this? Thank you kindly for all your hard work!!! Yes, I have seen many of the threads about this subject. There IS a page on the FDA website that talks about skin protectants and mentions “lip balm” in the same sentence, and it was updated in March — but the changes were minor, from what I can see. There IS a class of over-the-counter drugs called “skin protectants” that has “lip balm” as one of approved ways to identify the product. And, there was a screen-shot of a post/message that someone posted that someone said that they were told (apparently by a local FDA Agent) not to use “balm” because it is a “claim”. This issue has come up before. The term “balm” – like the term “natural” – is not defined in the regulations. The monograph for skin protectants is for products that CLAIM to protect the skin (from the sun, wind burn, chapping, etc) or to heal (chapped skin). By so claiming, the product is a drug and only meets the requirements for an OTC drug if it meets the requirements stated in the monograph. You can read the whole post, including my email and the response in More on Lip Balm. I don’t think there has been any official change in that position. Nothing has been published clearly stating so (as far as I could find). The important point is that it is the intended use of the product that determines what it is. If the intended use of a “lip balm” is solely to moisturize, and not to protect or treat, then it is – by definition – a cosmetic. The issue arises when one oversteps the bounds and claims that a lip product WILL prevent or cure chapped lips … then it is a drug regardless of whether you call it “lip smackers” or “soft lips” or “lipstick” or “lip balm”. And then, of course, there’s always the chance that someone in the FDA is going to have a different interpretation. It happens. Hi Marie! Thank you so much for being such a valuable resource for us at home small businesses. I’ve been reading through the FDA’s Labeling Guide and I’m even more confused than when I started. I called the FDA and they just kept referring me back to the guide. I just started my at home business and am in the process of creating labels for my lip balms. I’m using the standard .15 oz/4g. cylindrical chapstick-type tubes. I’m confused on what size type/font I need to use for the required information and placement on the label. What size font is required for my product name, and business address? It sounds like from what I read, the ingredients need to be either 1/16″ or 1/32″. Which is correct for that size tube? Also, can the net weight be placed under the ingredients or does it have to be placed under the name of the product? I can’t tell you how much I appreciate your help. For a label with a principal display panel (front) that is less than 5 square inches, the net weight must be at least 1/16″ high (measuring the lower case “o”). On that small a label, the position at the bottom of the label is waived. For a container that has a total of “labelable space” that is less than 12 square inches the ingredient declaration may be reduced to not less than 1/32″ in height (measuring the lower case “o”). Keep in mind that if your ingredients are that small, you need to double-check the printing to make sure the text is still readable. Some printers don’t do so well with tiny text like that. I have been been following you for a while and your resources have been a serious help to me! So thank you for that! I don’t know if you would know much about this but I have a question about lip scrubs/exfoliators. Like you said above, chapped lips is considered a disease and a lip exfoliator would be “treating” the disease, so would it be considered a drug even if I simply just claim it “improves lip appearance”? “Chapped lips” is considered a “disease” and “treatment” is considered a drug. I think that in treating “chapped lips” the FDA is considering that you are somehow going “under the hood” to make some change to the function or structure of the body. On the other hand, an exfoliant, IS a cosmetic. It is, by definition, only addressing the outside layers of skin (not going “inside”). So “improving lip appearance” by “exfoliating the lips” …. cosmetic. What if we label something “lip care” and market it as a cosmetic? “Lip care” should work — just don’t make any claims that the product will treat or prevent chapped lips.